Lorraine Sterritt has been selected as the seventeenth president of Saint Michael’s College in Colchester, Vermont. 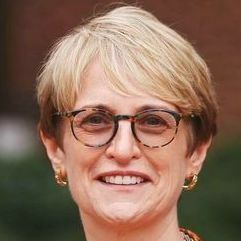 When she begins her new role in July, Dr. Sterritt will be the first woman to serve as president of Saint Michael’s College since its founding in 1904. The college, located near Burlington, is affiliated with the Roman Catholic Church. According to the most recent data from the U.S. Department of Education, Saint Michael’s College enrolls about 1,900 undergraduate students and more than 300 graduate students. Women make up 56 percent of the undergraduate student body. Since June 2014, Dr. Sterritt has served as president of Salem College in Winston-Salem, North Carolina. Salem College was founded by the Moravian Church in 1772. It is the oldest continuously operating educational institution for women in the United States. Before becoming president of Salem College, Dr. Sterritt served as dean for administration and as a professor of French literature at Harvard College. Earlier, she was associate dean for graduate and undergraduate studies in the School of Humanities at Stanford University and dean of freshmen and director of academic advising at the University of Pennsylvania. Dr. Sterritt is a native of Ireland and earned bachelor’s and master’s degrees at Queen’s University Belfast. She came to the United States in 1985 and earned a second master’s degree and a Ph.D. in French at Princeton University.